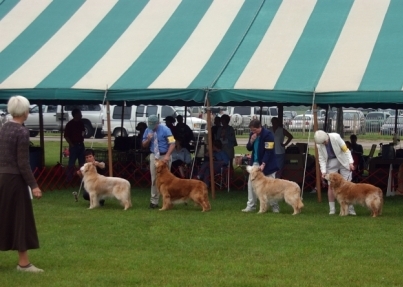 Yankee holds an Independent Specialty Show, Obedience Trial, and Rally Trial each spring. Check the Yankee Event Calendar for information about this year's show. 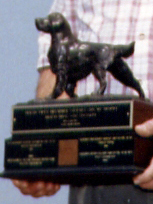 For permanent possession a challenge trophy must be won three times by the same owner, not necessarily with the same dog nor at consecutive shows. 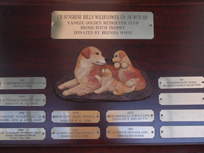 Trophy remains in the possession of Yankee Golden Retriever Club until retired. Winner each year receives a commemorative award. 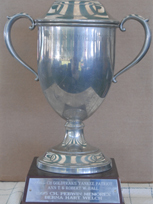 If you are eligible to retire a trophy, you have 90 days to notify the YGRC secretary of your plans (trophy policy). 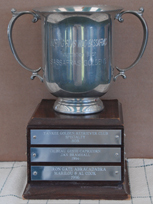 A polished pewter loving cup on a wooden base, offered by the Yankee Golden Retriever Club in loving memory of John R. Collins at its annual specialty show. 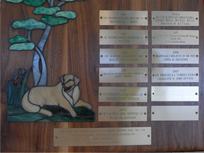 Trophy redonated by Berna Hart Welch, Pebwin Golden Retrievers. A pewter loving cup on a wooden base offered by Lorraine Rodolph through the Yankee Golden Retriever Club at its annual specialty show. A pewter loving cup on a wooden base offered by John & Charlene Devens, Yukon Golden Retrievers, through the Yankee Golden Retriever Club at its annual specialty show. 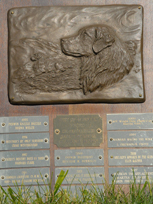 A bronze raised relief on a wooden plaque designed by Marcia Schler, offered by Ann & Robert Hall through the Yankee Golden Retriever Club at its annual specialty show. A painted wooden carving of a Golden Retriever on a plaque offered by Jan Bramhall, Beau Geste Golden Retrievers, through the Yankee Golden Retriever Club at its annual specialty show. 2018 S1 — Claircrest Secret Love Affair / Alyssa Gorman & Nickie Hertzog. A stained glass plaque offered by Robin P. Fay through the Yankee Golden Retriever Club at its annual specialty show. A polished pewter brandy snifter on a wooden base, offered by Audrey Collins, through the Yankee Golden Retriever Club at its annual specialty show. 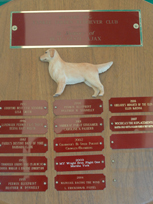 Trophy redonated by Julie McKinnon, Nautilus Golden Retrievers. A cast bronze "Golden Prospects" set on wooden base offered by Marcy Myers through the Yankee Golden Retriever Club at its annual specialty show. 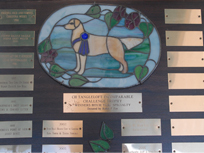 A stained glass plaque offered by Dianne Tyree through the Yankee Golden Retriever Club at its annual specialty show. A stained glass plaque offered by John & Charlene Devens, Yukon Golden Retrievers, through the Yankee Golden Retriever Club at its annual specialty show. A ceramic plaque designed by Marcia Schler, offered by Brenda & Eric Wood through the Yankee Golden Retriever Club at its annual specialty show. A bronzed full body sculpture of a Golden Retriever by Jean Spause, produced by Heredities, mounted on a wooden base offered by Ann Houston through the Yankee Golden Retriever Club at its annual specialty obedience trial. 1998 — Tricon Starchaser / Karen Frink & James Downar Jr.
A walnut framed stained glass Golden head, handmade and donated by Donna Benoit and offered by the Yankee Golden Retriever Club at its annual specialty trial. A bronze sculpture of a reclining Golden Retriever on a wooden base, donated by Susan Latham and offered by the Yankee Golden Retriever Club at its annual specialty trial. A Dannyquest trotting Golden Retriever statue offered by James Downer & Karen Frink in memory of Am/Can OTCH UCDX Tricon Starchaser UDX2 MX MXJ AXP NJP through the Yankee Golden Retriever Club at its annual specialty trial.